Minneapolis - Congratulations to the latest graduating class of Flexographic Tech’s Press Operator course: Andrew Webber, Aaron Pitt, Xai Thao, and Vang Thao. When the now-graduates began the course almost 12 weeks ago, they were completely new to flexographic printing. After completing the rigorous mix of 80% hands-on and 20% classroom training, all four graduates are now able to successfully operate flexographic presses. Part of the students’ final was to run a tight register, seven-color job with a die cut. In order to receive maximum points, they were required to set up the job in under 850 feet. Time played a pivotal role in the grading process, as the students had to perform both setup and clean up in less than 3.5 hours. In addition, the students completed an intense 150 question written final and achieved their FTA Level One Certification. 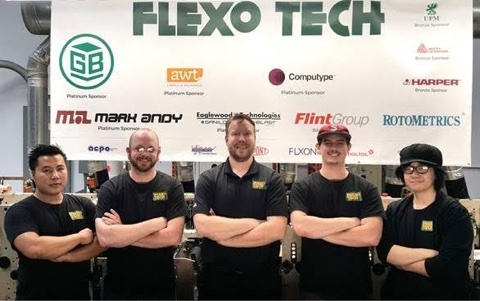 Andrew Webber, Blanco Inc.: Flexo Tech is a great way to get your foot in the door of flexographic printing. This course is perfect for learning all of the ins and outs of this industry and it will teach you all of the skills needed to be a successful printers. I would recommend this class to anyone interested in this career path. Xai Thao, AWT Labels & Packaging: I was working as a press helper who was new to the flexo industry. After going through the Flexo Tech Press Operator training program I was able to become an entry-level operator, not a helper anymore. I am excited about my new career and the benefit it will have on my future. Aaron Pitt, Computype: Flexo Tech has really opened my eyes to the flexographic printing industry. There's so much to learn, and Shawn made it really fun. After the course I feel like I have the knowledge to put out the highest quality product every time I work.